Developed by Just Add Water. Published by Just Add Water. Released July 22, 2014. Available on PS4. Oddworld was a bona fide obsession of mine when I was younger. 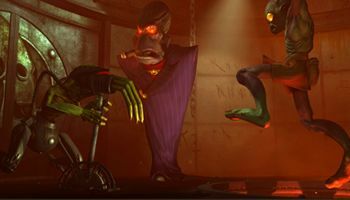 Though the concept of a densely populated world telling multiple stories through loosely connected games never quite got off the ground, the original releases - Abe's Oddysee and Abe's Exoddus - were games I played to an addicted degree. So addicted, I'd instinctively try to quick save before crossing a street. Something about Oddworld Inhabitants' darkly humorous universe spoke to me, and it's a connection I've never quite severed. Though it's been many years since I played through the original PlayStation platformers, Oddworld: New n' Tasty brought the memories back as vividly as they'd ever been. Abe, the stitch-mouthed, croaky protagonist, poking his head through a hole in the wall, greeting the player with a sad smile. Molluck the Glukkon, cigar in mouth, unveiling Mudokon Pops to a room of laughing executives. The mechanical grinding of a Slig's robotic pants, and the unmistakable droning of the protagonist's possessive chant. The word "iconic" is tossed around far too liberally in the game industry these days, but the sights and sounds of Abe's Oddysey are worthy of the word's inherent meaning. Backed by such nostalgia, it would have been very easy for Just Add Water to, well, "just add" high-definition visuals. Most "remakes" these days are little more than graphical upgrades, with developers banking on goodwill and rose-tinting to earn themselves a pat on the head. With New n' Tasty, however, the entire thing has been rebuilt from the ground up, and it shows. A game I knew like the back of my hand feels truly new in every sense of the word. Every level feels different (even when it isn't), the sounds refreshed, the controls tightened. This is not just a prettier version of Oddysey, this is a whole new game wrapped in warm and familiar clothing. Retelling the original PlayStation One story, New n' Tasty is the tale of Abe, an enslaved "employee" of Rupture Farms. His entire race, the Mudokons, are under the bootheels of Molluck the Glukkon, whose meat processing business is driving various creatures to extinction. To combat the imminent lack of menu items, Molluck plans to turn the Mudokons themselves into the latest food craze, a plan Abe stumbles upon and resolves to stop. It's a heartwarming yarn of capitalism, mass murder, and farting. Oddworld is a sidescrolling puzzle-platformer with a macabre sense of humor, a game in the same veins as Heart of Darkness and its ilk. As one of the earlier and most influential games of its kind, Abe's Oddysee can claim some credit for the appearance of such critically acclaimed darlings as Limbo, and thanks to the changes Just Add Water have made, New n' Tasty is more than capable of standing alongside more contemporary titles. With a slightly swifter pace and more fluidity in the controls, Just Add Water has taken what would be an incredibly dated experience (the last time I played Abe's Oddysey, it was rough going) and produced something that feels brand new. Abe is far less sluggish now, and chase sequences are quicker and more exciting. Puzzles are more tightly designed, though one or two of them are prone to elements of frustrating randomness or guesswork, while the mid-game sections involving high-speed sprinting courses on the back of Abe's trusty steed Elum are immensely fun. New dramatic camera angles make everything feel more exciting without getting in the way of the gameplay itself. Also, quicksave and quickload being accessed by the touchpad (pressing and holding, respectively) is cute! All the classic elements are preserved, of course. Abe can still chant to posses the deliciously brutish Sligs, using them to attack other enemies and forcing the monsters to explode in a glorious shower of giblets. Using various speak commands, Abe can communicate with other Rupture Farms workers, getting them to follow him through traps before opening a portal and rescuing them (a crucial optional step if one wants to achieve the good ending). Paramites lurk in the shadows, waiting to lure Abe into traps. Violent Scrabs stalk the desert, requiring quick maneuvers and jumps to evade. Despite a slicker production, Just Add Water has not been afraid to resurrect something I remember all too well about these games - controller-tossing frustration. Puzzle-platformers centered on lethal environmental hindrances are always going to induce rage. It's part of their charm, and this is something New n' Tasty remembers passionately. Navigating the brutal world can require a lot of bloodsoaked trial and error, and finally nailing a tricky section is as relief-inducing as it always was. As I said, there are some moments that feel more like luck than brains or skill are needed (segments involving bats can sod off forever), but most of the time, this is frustration done right - a game with set rules that will punish you harshly for ignoring them, and made a bit fairer with more precise jumping and less stodgy player movement. New n' Tasty boasts an all-new aesthetic, with the Unity Engine showing what it can be capable of when not in the hands of amateurs selling trash on Steam Early Access. The thoroughly gorgeous graphics, with beautiful animations and a wonderful use of color contrasts, bring Oddworld to life better than anything else has before, while the ambient sounds, music, and vocal effects have all been updated to make a game that feels so much more alive. The game has traded off some of the delightful sweeping scenery shifts that Abe's Oddysey showcased, but it was a worthy trade. The lighting is stunning, explosion and gore effects are tantalizing. The only real complaint here is the silliness of the corpse physics, with ragdolls twitching and thrashing on the scenery almost consistently. It's hard not to be supremely impressed by what Just Add Water has done with Oddworld: New n' Tasty. As much as I adored the original games, I cannot emphasize enough just how poorly they aged in several regards. Compared to this production, the first game appears drab, lifeless, and archaic. That is only in small part due to the original itself, with much of the credit going to just how excellent Just Add Water's work is. Simple fact of the matter is, New n' Tasty did not have to go as far as it did in rebuilding the entire game from scratch. It could have put in far less effort and it would likely have gotten away with it. Instead, Abe's Oddysey was treated with love and respect, and it shows. Bottom Line: Just as Abe's Oddysee was a classic of the PlayStation era, so too should Oddworld: New n' Tasty be a classic of the modern age. More than just a remake, this is a contemporary puzzle-platformer that charms, exasperates, and delights. This is how you do a reboot. Recommendation: Whether you're new to the series, or a veteran of the PSX days, New n' Tasty is a damn fine slice of meaty entertainment.